Background: Periodontitis and osteoporosis are two diseases found worldwide and increase in intensity with increasing age of the patients. The severity of osteoporosis and periodontitis are found to be more in women during menopause. The aim of this study was to assess and correlate osteoporosis and periodontal disease among post-menopausal women. Materials and Methods: The study consisted of 94 postmenopausal women in the age range of 45–65 years. All the women underwent dual-energy X-ray absorptiometry (DXA) scan to measure bone mineral density (BMD) and were graded as normal, osteopenic, and osteoporotic based on the T score obtained. Data regarding patient's educational level, socioeconomic status (SES), and body mass index (BMI) was recorded. A detailed periodontal examination was carried out using clinical parameters such as oral hygiene index (OHI), plaque Index (PI), probing pocket depth , and clinical attachment loss to check the level of periodontitis. The level of osteoporosis was correlated with the level of periodontitis. Results: The DXA scan revealed that four women were normal, 44 were osteopenic and 46 were osteoporotic. There was no association found between BMD and OHI, PI, educational status, SES, and BMI. Slight periodontitis was observed in eight women, moderate periodontitis in 62, and severe periodontitis in 24 women. Result suggests that there was a statistical correlation between periodontitis and osteoporosis (P = 0.045). Conclusion: There is a definite correlation found between the severity of periodontitis and osteoporosis among postmenopausal women. A close cooperation between general practitioners and dentists in early diagnosis and treatment of both the diseases will reduce the risk and morbidity among postmenopausal women. Osteoporosis refers to a condition where there is a decrease in both the bone matrix as well as the bone mineral content. It is characterized by a decrease in the density of bone resulting in fragile bones which tend to fracture on minor accidents. Periodontitis is an inflammatory disease, characterized by the loss of soft tissue and resorption of tooth-supporting alveolar bone. Osteoporosis and periodontitis are chronic, multifactorial diseases that result in bone loss, both of which are exacerbated by local and systemic factors. Periodontitis like osteoporosis is a silent disease, not causing signs and symptoms until late in the disease process. Osteoporosis usually occurs in elderly patients and affects females at an earlier age than males. It is a physiologic condition of postmenopausal women when estrogen levels decreases resulting in a rapid bone loss. The hormonal imbalance affecting postmenopausal women has also been attributed to increase the prevalence of periodontal diseases among them. One in three women over 50 years and one in two women over 60 years will suffer from fracture of the bone, due to osteoporosis. The burden of morbidity from osteoporosis has significant medical, social, and financial implications. India is home to a very large population of osteoporotic women and is increasing with increase in the survival rate of elderly subjects. The extent of the relationship between osteoporosis and periodontal diseases remains unclear, and research conducted in this aspect will help uncover the truth of the interrelationship. With this background, the present study was designed to assess the level of osteoporosis and periodontitis in postmenopausal women and correlate bone mineral density (BMD) with the level of periodontitis. This descriptive cross-sectional study was conducted on 94 postmenopausal women aged 45–65 years. The subjects were randomly selected from an outpatient section of Krishna Institute of Medical Sciences Hospital. The study protocol was carried out in accordance with the ethical standards outlined in the 1975 Declaration of Helenski, as revised in 2013. Ethical approval was obtained from the Institutional Ethical Committee of Krishna Institute of Medical Sciences Deemed University (KIMSDU), Ref no. KIMSDU/IEC/04/2014, dated September 23, 2014. All the subjects were explained about the objectives of the study, and informed consent was obtained before enrolling them. The study was conducted during from November 2015 to August 2016. Postmenopausal women aged between 45 and 65 years, suffering from periodontitis. Patients who agreed to participate voluntarily to be part of the study, with at least 20 natural teeth. Women suffering from parathyroid disease, metabolic disease, thyroid disease, gastrointestinal disorder or any malignancy and with a history of early onset of menopause. Patients on long-term steroid medication, hormone replacement therapy, calcium supplements were not considered. Patients with a history of hysterectomy or undergone periodontal treatment within past 6 months. Patients who used tobacco in smoked or smokeless form were also not considered. Initially, 106 postmenopausal women were enrolled for the study, but only 94 were recruited for the study as 12 patients did not fulfil the inclusion criteria. The personal, medical, dental, and osteoporosis history were recorded on predesigned pro forma. Body mass index (BMI) of all subjects was calculated by dividing weight in kilograms by height in meters squared and tabulated. 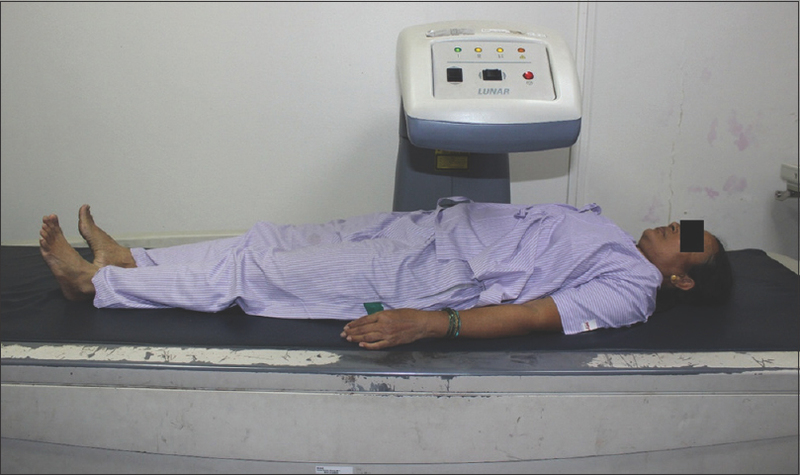 All the selected women were subjected to dual energy X-ray absorptiometry (DXA) scan to check for the level of osteoporosis. Based on the T score obtained by BMD test using DXA; the patients were divided into three groups as healthy, osteopenic and osteoporotic patients. The level of osteoporosis and periodontitis were correlated to find out whether periodontitis was a risk factor for osteoporosis and vice versa. BMD of the subjects was measured using DXA scan with Prodigy system (GE, Prodigy health care system, Encore version 12.30, Madison WI, USA) in anteroposterior view of lumbar vertebrae one to four (L1 to L4) [Figure 1] and [Figure 2]. All DXA scans were performed and analyzed by a single radiologist, who was blinded to the periodontal status of the patients. The DXA value or “T” score is a comparison of patients BMD to that of a healthy 30-year-old adult with peak bone mass. The World health organization (WHO) defines osteoporosis and osteopenia by measures of standard deviation (SD) as compared to that of normal healthy young adult and graded as follows [Table 1]. The clinical parameters such as plaque index (PI), oral hygiene index (OHI), probing pocket depth (PPD) and clinical attachment loss (CAL) were recorded by one trained and calibrated examiner and the values were validated and confirmed by a senior periodontist to minimize the observer bias. The PI was measured using Turskey-Gilmore-Glickman Modification of the Quigley Hein PI, 1970. Disclosing agent (Alphaplac, DPI, Wallace Street, Mumbai, Maharashtra, India) was used to disclose the plaque during the PI examination. PI for the entire mouth was determined by dividing the total score by the number of surfaces examined, Score 0 or 1 is considered as low plaque and Score 2 or more was considered high plaque. The clinical parameters PPD and CAL were measured using a periodontal probe (UNC-15, Hu-Friedy, Chicago, IL, USA) to the nearest millimeter. The periodontal probe was inserted parallel to the vertical axis of the tooth and walked circumferentially around each tooth with standardized constant probing force 0.75N. The measurements for PPD and CAL were recorded at four sites per tooth (mesiobuccal, distobuccal, midbuccal, and midlingual) of all the teeth, except third molars. PPD was measured from gingival margin to the base of gingival sulcus, and CAL was measured from cementoenamel junction to base of the gingival sulcus. The participants were classified as having chronic periodontitis based on 1999 consensus classification of periodontal disease. Based on the average CAL, all chronic periodontitis subjects were categorized into three categories: slight (1–2 mm), moderate (3–4 mm), and severe (≥5 mm). The obtained data was entered in MS excel sheet and subjected to statistical analysis. Statistical analysis was performed using Statistical package for the social science software (SPSS Inc., Released 2007 SPSS for Windows, Version 16.0. Chicago, IL, USA). Descriptive statistics such as frequency and percentage were calculated for all the variables. Chi-square test was performed to assess the association between study variables. Association was said to be significant if P ≤ 0.05. After screening for eligibility using inclusion and exclusion criteria 94 postmenopausal women were selected for the study and grouped as per their age [Table 2]. Patients OHI and PI scores were correlated with their BMD values. Results suggested that there was no statistical significant relationship between OHI, PI, and BMD [Table 3] and [Table 4]. The education level of the patients was correlated to the BMD values. Majority of the patients belonged to 4–10 grade of education (57), out of whom three were normal, 29 were osteopenic, and 25 were osteoporotic. However, there was no statistically significant relationship between educational status and BMD (P = 0.51) [Table 5]. The socioeconomic status (SES) of the patients was correlated with the BMD status. Sixty-three patients were in 5000–10,000 Rupees annual income group of whom three were normal, 25 were osteopenic and 35 were osteoporotic. Results suggested that there was no association between SES and BMD (P = 0.33) [Table 6]. Results suggest that there was no statistically significant relationship between postmenopausal history, BMI, and BMD [Table 7] and [Table 8]. Majority of patients had moderate periodontitis (n = 62) out of whom three were normal, 23 were osteopenic, and 36 were osteoporotic. Results suggest a statistically significant correlation between periodontitis and BMD (P = 0.045) [Table 9]. Bone remodeling is a lifelong process, which allows the replacement of old tissues, repair of injuries and adaptation to physical constraints. Metabolic bone diseases such as osteoporosis that lead to demineralization are the result of unbalanced remodelling cycles so that less new bone is formed than resorbed at each cycle of active remodeling. Osteoporosis is characterized by low skeletal bone mass and fragility, which cause hip, radius, and vertebral fractures on minor accidents. Since bone loss in osteoporosis is a generalized condition it also affects the cranial skeleton, and there is evidence of loss of alveolar bone as a manifestation of osteoporosis. Reports indicated that age-related loss of bone is more pronounced in postmenopausal women due to estrogen deficiency. The mechanism by which estrogen deficiency causes bone loss remains largely unknown. Estrogen deficiency leads to an increase in the immune function, which culminates in increased production of tumor necrosis factor (TNF) by activated T-cells., TNF increases osteoclast formation and bone resorption both directly and by augmenting the sensitivity of maturing osteoclasts to the essential osteoclastogenic factor receptor activator of NF-j B Ligand., Increased T-cell production of TNF is induced by estrogen deficiency through a complex mechanism mediated by antigen presenting cells and involving the cytokines interferon-δ, interleukin (IL)-7, and tumor growth factor-β. Periodontitis is a chronic inflammatory disease characterized by the destruction of tooth supporting tissues. This destruction is mediated by inflammatory cytokines such as IL-1, TNF-α, and IL-6, which have been reported to be responsible for the loss of bone density in osteoporosis through their effect on osteoclast activity. Studies on the systemic influence of periodontitis have theorized that locally produced proinflammatory cytokines such IL-1, TNF-α, and IL-6 may be released into the circulation. These inflammatory cytokines are responsible for the loss of bone density in osteoporosis through their effect in osteoclast activity. There is evidence given by Genco and Loe that the systemic conditions and disorders affects periodontal disease process and indicated that osteoporosis could be implicated as a contributing factor for progression of periodontal disease and tooth loss. Osteoporosis may accentuate the already existing periodontal diseases which are more prevalent in many developing and developed countries leading to early loss of teeth and have a great impact on the quality of life. The present cross-sectional study was conducted to determine the association between osteoporosis and periodontitis in a group of 94 postmenopausal women. The study participants were divided into three groups as; normal, osteopenic, and osteoporotic group, based on the BMD test, aided by medical history. Early onset of menopause is an established factor for osteoporosis. Therefore, only those patients who had natural menopause in the age range of 45–65 years were considered for the study. Various methods to detect BMD are quantitative computerized tomography, DXA and ultrasonography. 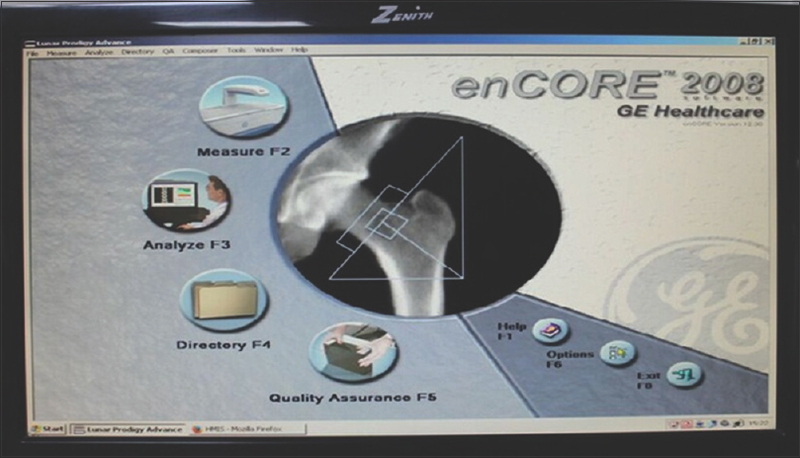 DXA scan is considered the gold standard method for diagnosing osteoporosis as it produces fewer artifacts. DXA scan can be performed at various sites are lumbar vertebrae, radius, hip, and ankle to assess BMD but among these sites L1–L4 lumbar vertebrae are preferred for a scan as it shows more degenerative changes frequently than other sites., Hence, DXA scan at L1–L4 lumbar vertebrae was considered in this study. On comparison of parameters such as gingival index, PI, SES, and BMI with BMD our study did not show any significant correlation. In contrast, studies done by Drozdzowska et al., Famili et al. showed statistical significance between the gingival index and PI and BMD. Based on the findings of our study, there is a significant association between BMD values and CAL. 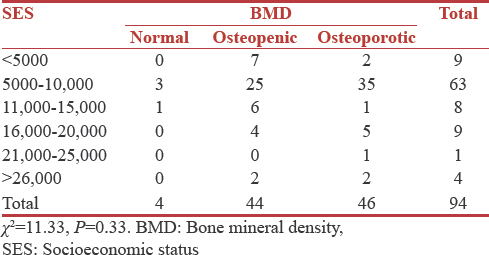 This suggests that osteoporotic women presented with higher CAL values than those with normal BMD. Concurrent findings were observed in studies conducted by (Suresh et al.,). However, few studies did not show an association between osteoporosis and periodontal disease., The difference in the results of these studies may be attributed to racial variation in the study population, design of the study, and the presence of other confounding factors such as occlusion and smoking. This would suggest that early diagnosis of low BMD before the occurrence of periodontal disease can help us in facilitating preventive treatment strategies to minimize its effects of progression of periodontal disease. Furthermore, early diagnosis and treatment of periodontal disease can reduce the risk of osteoporosis among postmenopausal women. The study consisted of smaller sample size and further longitudinal studies with larger sample size are required for better understanding of the relationship between these two diseases. Periodontist and orthopedicians should understand the effects of osteoporosis on both systemic and oral health. These two healthcare providers working together could increase the awareness among people, offer early diagnosis of the disease, elucidate solutions, and fabricate treatment modality. Within the limitations of the study following conclusion can be drawn. The level of education, PI, OHI, BMI, and SES did not have any association with level of osteoporosis. Aspalli SS, Shetty VS, Parab PG, Nagappa G, Devnoorkar A, Devarathnamma MV, et al. Osteoporosis and periodontitis: Is there a possible link? Indian J Dent Res 2014;25:316-20. Suresh S, Kumar TS, Saraswathy PK, Pani Shankar KH. Periodontitis and bone mineral density among pre and post menopausal women: A comparative study. J Indian Soc Periodontol 2010;14:30-4. Veeresha KL, Gupta P. Osteoporosis: A silent oral health deterrent. J Dent Oral Hyg 2013;5:51-4. Armitage GC. Development of a classifi cation system for periodontal diseases and conditions. Ann Periodontol 1999;4:1-6. Melton LJ 3rd. How many women have osteoporosis now? J Bone Miner Res 1995;10:175-7. Bando K, Nitta H, Matsubara M, Ishikawa I. Bone mineral density in periodontally healthy and edentulous postmenopausal women. Ann Periodontol 1998;3:322-6. White SC. Oral radiographic predictors of osteoporosis. Dentomaxillofac Radiol 2002;31:84-92. Persson RE, Hollender LG, Powell LV, MacEntee MI, Wyatt CC, Kiyak HA, et al. Assessment of periodontal conditions and systemic disease in older subjects. I. Focus on osteoporosis. Johnell O, Kanis J. Epidemiology of osteoporotic fractures. Osteoporos Int 2005;16 Suppl 2:S3-7. Reddy MS. Oral osteoporosis: Is there an association between periodontitis and osteoporosis? Compend Contin Educ Dent 2002;23:21-8. Bhardwaj A, Bhardwaj SV. Effect of menopause on women's periodontium. J Midlife Health 2012;3:5-9. Tezal M, Wactawski-Wende J, Grossi SG, Ho AW, Dunford R, Genco RJ, et al. The relationship between bone mineral density and periodontitis in postmenopausal women. J Periodontol 2000;71:1492-8. Kimble RB, Matayoshi AB, Vannice JL, Kung VT, Williams C, Pacifi ci R, et al. Simultaneous block of interleukin-1 and tumor necrosis factor is required to completely prevent bone loss in the early postovariectomy period. Endocrinology 1995;136:3054-61. Pejčić A, Kojović D, Grigorov I, Stamenković B. Periodontitisand osteoporosis. Facta Universitatis. Ser Med Biol 2005;12:100-3. Klemetti E, Collin HL, Forss H, Markkanen H, Lassila V. Mineral status of skeleton and advanced periodontal disease.J Clin Periodontol 1994;21:184-8. Lin TH, Lung CC, Su HP, Huang JY, Ko PC, Jan SR, et al. Association between periodontal disease and osteoporosis by gender: A nationwide population-based cohort study. Medicine (Baltimore) 2015;94:e553. Hildebolt CF. Osteoporosis and oral bone loss. Dentomaxillofac Radiol 1997;26:3-15. Shum I, Leung PC, Kwok A, Corbet EF, Orwoll ES, Phipps KR, et al. Periodontal conditions in elderly men with and without osteoporosis or osteopenia. J Periodontol 2010;81:1396-402. Moriya Y, Ito K, Murai S. Effects of experimental osteoporosis on alveolar bone loss in rats. J Oral Sci 1998;40:171-5. Elders PJ, Habets LL, Netelenbos JC, van der Linden LW, van der Stelt PF. The relation between periodontitis and systemic bone mass in women between 46 and 55 years of age. J Clin Periodontol 1992;19:492-6. Krall EA, Garcia RI, Dawson-Hughes B. Increased risk of tooth loss is related to bone loss at the whole body, hip, and spine. Calcif Tissue Int 1996;59:433-7.